The fictional scandals of House of Cards pale in comparison to the real scandals happening in China. Back in March, the media exposed the “Dongguan Beggar Gangs,” criminal gangs that cripple children and then force them to beg. The more miserable the children were, the more money these criminals would make. This news enraged Chinese readers, but I was angry at more than the criminal gangs. Back in 2004, my novel Fatal Weapon discussed in some detail the criminals in Shenzhen and other places crippling children, forcing them to beg. Although this was a novel, it was written after I was made aware of the situation at Shenzhen Railway Station. Crippling children and forcing them to beg is nothing new, and it’s not limited to Dongguan. It’s still happening all around us. I posted a weibo message about this. One after another, my readers kept asking: Why hasn’t the government taken action to stop these evil deeds? What are they busy doing? When will such stories finally disappear? I don’t know how to answer these questions. Maybe the government is busy controlling people like us who are trying to expose evil? Now I’m thinking: what if my book Fatal Weapon could have been published and made into a TV series? What if it became a show that’s widely aired, without restrictions (like those soap operas about love affairs between Qing Dynasty emperors and concubines, or the spy dramas about the founding of the PRC)? In that case, maybe today we would not be seeing news about “beggar gangs,” because the intense popular attention aroused by these fictional works would have already rooted out that sort of evil phenomenon! Of course, this makes me think about the popular American TV drama House of Cards. In this show, actor Kevin Spacey plays the role of Frank Underwood, the Democratic party’s House whip. 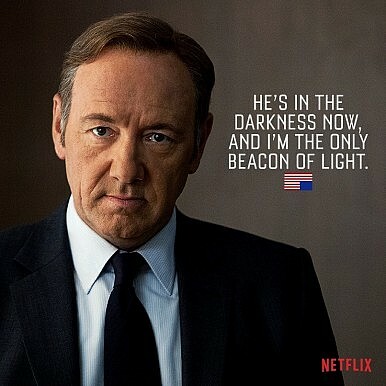 In the show, Frank is very powerful and capable: he manipulates congressional politics, uses and controls the media, and threatens and plays with his colleagues. House of Cards also shows Frank, then the vice president of the U.S., committing murder: he lures his former mistress to a Washington, DC metro station. When he discovers she is investigating his role in the murder of a congressman, Frank tries to threaten and bribe her. When that doesn’t work, he pushes his lover in front of a moving train. I’ve seen dirty governments, but I’ve never seen one this black: lies, deceit, threats, assassinations and even a three-way affair between Frank, his wife, and his bodyguard. It’s really an exciting show! It’s no wonder that many Chinese officials, who usually don’t comment on Chinese TV shows, have publicly stated that they enjoy this American TV show. Chinese Ambassador to the United States Cui Tiankai made a pointed remark that House of Cards revealed the disadvantages of the two-party system. Recently, the Central Commission for Discipline Inspection went even further, publishing an article saying House of Cards reveals American corruption. Ordinary Chinese people might not really understand what the two party system is, and they don’t necessarily care that the show reveals the disadvantages of democracy. But I bet there are a lot of Chinese people who watched House of Cards and now are grateful that they don’t live in the U.S. But really, the stories told in House of Cards never happened in the U.S.
For example, the main plot line throughout season one was that the Democratic whip used intrigue and political maneuvering to rise from a congressman to the vice president. Then in season two, Frank ensnares the president in political scandals, and eventually replaces him. U.S. history has never experienced this sort of life-or-death struggle between the president and the vice president, much less a vice president seizing power by framing the president. The scenes in House of Cards that show the U.S. vice president murdering his mistress and a congressman or using his assistant to kill people are equally false. Second, in his rise from a congressperson to vice president to president, Frank wasn’t elected to the latter two positions. This gave people the feeling that anyone who can play politics can become the U.S. president. Actually, in the U.S., there has never been a president who took office without going through a democratic election, except in the rare case when a president died in office and was replaced by the vice president (and even then, the vice president is elected along with the president). Of course, House of Cards is work of fiction. It can exaggerate and make things up as long as it keeps its internal logic and doesn’t stray too far from reality. The stories in House of Cards never happened, but that doesn’t mean such things can’t happen in the future. If there is no limit on power, people won’t be surprised to see even worse things happening than the events portrayed in the show. House of Cards presented the government in the most negative light possible, taking great pains to defame and slander a fictitious president and a group of “public servants.” Even while the show was attracting and entertaining its audience, it was making people be more cautious about the government and the use of power. And House of Cards is just one of many American TV shows and Hollywood blockbusters that has this sort of plot. There’s also Homeland, The Blacklist and Scandal, all American TV shows that target the White House, the intelligence services, the police, and the powerful. Now that we know that the evil games played by powerful people in House of Cards never occurred in the U.S., should we turn our attention to the places that never allow fictional works to criticize the government and defame those in power? If we’re talking about political killings, officials murdering their mistresses, or corruption involving millions and billions of renminbi, hasn’t China already seen plenty of these things? Bo Xilai’s wife poisoned an English businessman. The son of Ling Jihua, the chief of the General Office of the CCP (quite a high position), was driving late at night with two young women before he crashed his car and died. Afterwards, the president’s bodyguards (the security from Zhongnanhai) went to the accident scene to hush things up, but now Ling’s brother has been detained. And I hardly need to mention that, in the past year, several hundred officials holding positions similar to a state governor in the U.S. have been detained. Some of these officials had over 100 million RMB ($16 million) in cash hidden in their homes, as well as gold and silver. Aren’t all these cases even more thrilling than the fake story told on House of Cards? Yet this same country uses a fictional TV show to attack America. Of course, our officials don’t really believe such scandals happened in the United States. However, most Chinese people don’t know much about America, so when the propaganda bureau uses House of Cards to reflect on the U.S., the majority of Chinese people will believe it. They might even feel sad that Americans’ lives are so tragic, and think how lucky they are to live in a socialist country. House of Cards exposes the disadvantages of the American democratic system, but it would be very difficult for the political struggles, murders, love affairs and corruption depicted in the show to really happen in the United States. However, corruption, power struggles, and murders that are even more cruel and evil than the fictional story of House of Cards occur regularly in the very countries that would never allow such a show to be made! If the U.S. banned TV series like House of Cards, shows that reveal the downside of the two party system, then these fictional stories might actually become reality. Looked at this way, the biggest advantage of the democratic system might be the fact that fictional works like House of Cards are allowed to expose the disadvantages of democracy. Rather than treating House of Cards as a knife that exposes the downsides of democracy, we should see it as a tool to protect the democratic system! Sorry — I’ve touched on crippled children and Fatal Weapon, and then moved on to House of Cards, but I forgot to answer the question raised by the netizens: When will we finally see the end of rampant corruption, abuses of power for personal gain, and the victimization of children? In my view, when books like my Fatal Weapon can be made into a TV series, when Chinese television shows reveal the corruption, darkness, and pain of China, then our reality will become more and more beautiful, and life will have more and more sunshine. An earlier version of this piece appeared in Chinese on Yang Hengjun’s blog. The original post can be found here. Did China's Anti-Corruption Fight Give the US an Intelligence Windfall?Aide to China's Former President Expelled From Party, to Face TrialThe Legacy of a Fallen Chinese PoliticianWere China's Corrupt Officials Plotting a Coup?What State Secrets Did Zhou Yongkang Leak?